Today we found four lovely penny buns (or porcini, or ceps), and decided to be decadent and try out a pure fresh penny bun soup. The results were delicious, but a bit too rich and thick. In future, I’d probably go for a maximum of half penny buns and half some other, milder mushroom. And more water/stock/wine than I used below. I might also replace the double cream with single cream or milk. Chop the garlic and shallots and fry in butter for four minutes. Chop the penny buns and add them to the pot, frying for a further six or seven minutes. Add the stock, wine, salt, pepper and thyme, and simmer for 15 minutes. Add cream, blend, reheat to hot and then serve. Not real hedgehogs, I promise. This soup was made from hedgehog mushrooms and field mushrooms – and very nice it was too. I would definitely make this again. The bread in the picture is from a sourdough loaf I made after attending a class with Nick Beddows of Slow Food Brighton. 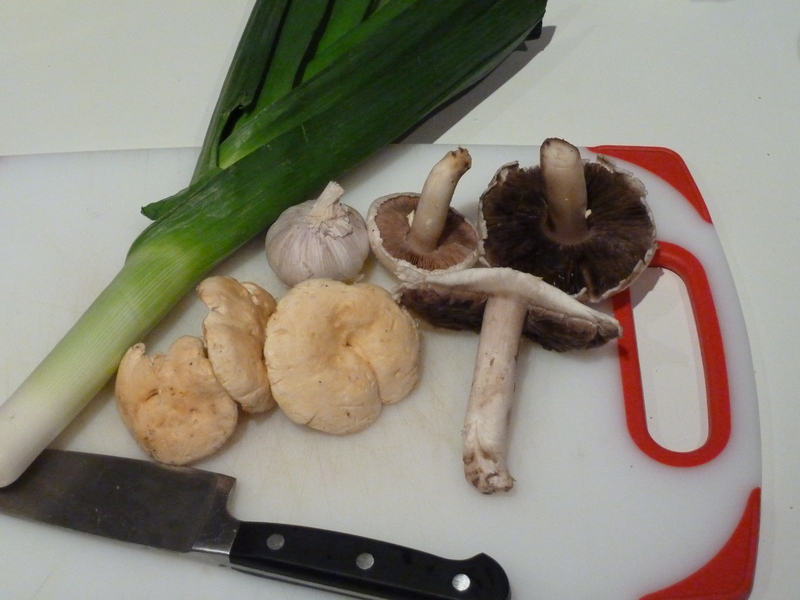 Fry garlic and leek for five minutes until soft, then add chopped mushrooms and cook for another 5-7 minutes. Add the stock, milk and herbs and simmer for 20 minutes. Blend until smooth. Add salt and pepper to taste.